Susan being annoyed at Alex not telling her about Katya. Max telling Karl he needs to get over Susan. The Timmins boys settling into prison. Steph is fixing a bike in the living room and asks Drew to pass her a socket (and boy has he not changed since he died in 2002). He hands her the socket but she drops it, which startles Steph and we find out that Drew isn't really back from the dead; Steph has just had a dream about him. Turns out it was Lyn dropping a spoon that started Steph awake, and Lyn apologises for scaring her half to death as she pours them a cuppa. Steph tells her mum that she had the weirdest dream and Drew was there. Lyn says that it isn't unusual to dream about him given how close they were but Steph thinks it is weird because since she got involved with Max, she's never dreamt of Drew. Lyn now suggests that it is a pregnancy thing which Steph initially accepts before wondering why she is dreaming of Drew now. 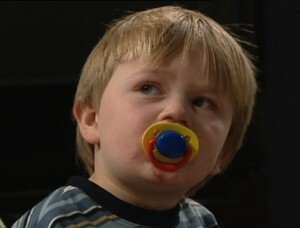 Steph changes the conversation to ask about how Joe is going with Toby and Lyn replies that he's phoned a few times before they get on with the reason why Lyn is over - painting. Karl and Max are hamming into some food looking rather hungover when Susan enters. She apologises to Karl for being grumpy last week, which he accepts. Karl asks if things have settle down yet and she replies yes before turning the subject onto Jenny. He tells her that they won't be seeing each other again because they realised that they were completely different people, which surprises Susan. Karl quickly changes the subject onto talking about running classes on exam stress management for the students and Susan agrees to go for a drink to talk about it before leaving. Max gives Karl ‘a look' over what he's just done. Stinger is acting funny, hyper like, as Dylan gives him the low down on the prison guards. The bell rings and Dylan starts to go out of the cell but Stinger is still hyper and jumping all over the shop, apparently due to the food he is eating. Dylan tells him to burn off the energy while he keeps a look out and Stinger prances about like he's at an aerobic class, and to keep the act up, Dylan turns on the TV to make it look like he is following a routine on the telly. Max tells Karl that as a mate, he should stop torturing himself over Susan and lying to her too (about Jenny) but Karl feels that he can't tell Susan the real truth - still carrying a torch for her. Max urges Karl to move on and reminds him that Susan has. Paul sits and waits for Roo to turn up and Roo isn't exactly thrilled to see Paul waiting for him and tries to do a runner but Paul has the place surrounded by heavies and so Roo is forced to stay. Naturally, Roo wants to know what Paul wants and Paul explains that the police are on route and they can have a nice little chat while they are waiting. Roo twigs that Paul has shopped him and Paul tells Roo to keep his brain cell active for their chat. Dylan is impressed that Stinger has managed to fix the TV and Stinger thanks him for looking after him inside and from now on he'll do as Dylan tells him as long as Dylan promises not to ditch him. Dylan agrees to his request and Stinger seems genuinely happy, before Dylan twigs that Stinger repairing TV's/things could be his survival card inside. Roo is getting exasperated because Paul isn't saying anything except to say Dylan's name and Roo mentions that he knows how Dylan and Stinger are getting on inside via his mates. Paul tells him that he stitched up the wrong bloke - it was him who grassed him to the police for robbing TSB and asks Roo if he is ready to make a deal or not after attracting Roo's attention to a briefcase on the floor. Roo isn't ready to make a deal and tells Paul that he is dead, but Paul isn't scared one little bit and calls in the muscles that were surrounding the building earlier as a threat to show Roo that he isn't scared. 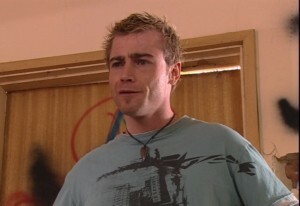 Realising he is beat, Roo tells Paul to start talking. Paul picks up the briefcase and it is full of money, lots of money! PAUL: Twenty-five grand and there is another twenty-five when you fulfil your end of the deal. 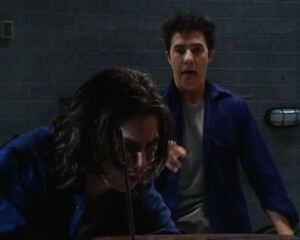 PAUL: You make a statement to the police backing up Dylan and Stingray's story of coercion. Pretty much get them off. PAUL: Your call. 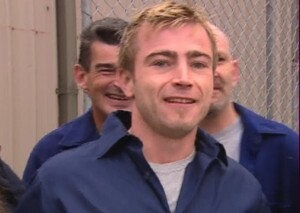 See you are going to jail no matter what you do and my way the judge goes easy on you for owning up and you end up with $50k and a clear conscious at the end. Roo is hesitant about accepting Paul's deal and Paul reminds him that time is running out so he'd better decide quickly. Susan is filling in Steph and Lyn about Katya and how Alex is using a private investigator to try and track her down. Naturally they are both shocked by Susan's news with Steph saying it sounds like something straight from the movies. Steph asks how things are progressing about the wedding, fine so far Susan replies and Lyn mentions that Janelle is looking forward to organising the hens night. This worries Susan immensely because she just wants something quiet and most importantly, no strippers! Susan adds that all they need now is to find a date to get married on and Steph adds that time is just flying by. They talk about the honeymoon - 4 weeks on the trans-Siberian railway! Apparently Alex's family are from Belarus and they are going to talk the kids with them too. Lyn becomes a bit upset and they both comfort her as she contemplates another lonely life since Joe has left and she isn't sure if he will be coming back. Roo is swithering about Paul's offer and wants to know how it works if he accepts it, so Paul explains that the money will be given to an intermediary who will then issue it slowly to Roo so the cops don't become suspicious. Roo however is suspicious that Paul will back out of the deal and Paul points out the obvious to him that he doesn't have a lot of options. He's almost accepting but Roo wants to know what's in it for Paul and why did he shop him in the first place, so Paul tells him that he didn't like what Roo did to the Timmins boys and he wants him gone. Roo doesn't believe Paul as the sirens are heard in the background but Paul isn't saying anymore. The police have now arrived and Paul says he has 10 seconds to decide. Lyn thinks of the things that she does have even if Joe doesn't return and realises how lucky she is. She also adds that while he is away she has a few ideas she'd like to implement to the salon and that she is going to ask Gino for a pay rise. Susan proposes a toast to new beginnings. STEPH: Babies, travels, adventures. To new beginnings. Steph informs Max that she has started painting the bedroom, which he is surprised at. He mentions that he doesn't like the smell of paint but Steph has a plan - they will camp in the living room until it dries. Max now decides he doesn't like camping and Steph wants to know what else he hates! His reply is delayed when he spots pink paint in Steph's hair and isn't enthralled at the prospect of having a pink bedroom but Steph explains that pink is the undercoat and the final colour is bohemian banana! Lovely! At a table, Susan is telling Karl about her wedding plans and wants to know why he hasn't rsvp'd yet. Karl says he can't come to the wedding and is stalling a bit for an explanation before blurting out that he doesn't think he can be her friend anymore. Susan naturally wants to know why, and Karl explains that he fells that is the way things have to be. After the conveniently placed commercial break, Karl explains his decision further to Susan. It isn't intended as a punishment to her but feels it is the way it has to be. Susan is still stunned by this, especially since it has come out of the blue, so finally he admits that he still cares for her, feels connected to her and even worries about her when she fights with Alex! He also adds that while she has moved on, he hasn't or can't. Susan is surprised at how Karl feels and wants to know what brought it on. “Jenny,” replies Karl and adds that she made him see a few things clearly and also tells Susan the real reason that they split up. 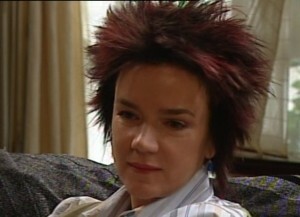 Susan is in major shock over what Karl has said and wonders if this is it and Karl replies that it is. Susan is now round at Lyn's and she is equally as stunned by what Karl has done and wants to know what suddenly happened, so Susan says it was Jenny seeing into his psyche. 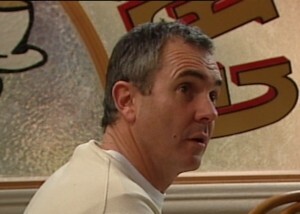 Lyn suggests that things couldn't have been easy for Karl lately with her relationship with Alex given that Karl is alone. Susan says that he had Izzy and adds how hard things were for her when they were dating, especially having to be civil to Izzy after stealing her husband. Susan also goes on about hugging and crying with Izzy when she lost the baby and adds that what Karl said was a load of rubbish. SUSAN: He left me and now that I'm finally happy, he can't deal with it. Oscar who is listening to this (great close up of him too) mustn't know what to think of this conversation especially when Susan starts ranting again. LYN: Now he really knows what he's given up. SUSAN: Tough! He made his bed let him enjoy every lonely, sleepless night lying in it! Great close up of Oscar looking at Susan after she's said that last part. Max now decides he likes camping in the living room and asks Steph not to gloat but she is tired and they spoon into each other eventually and settle down for the night. Dylan is looking at a picture of Sky and writing a letter to her when Stinger comes into the cell loaded with sweeties that he traded for repairing things. Dylan is stoked with the goodies he has obtained. Steph is dreaming again. The bike she and Drew were working on earlier is declared perfect and he hands her a helmet to go for a ride so they can see what the bike can do, despite her initial reluctance. Drew and ‘boss lady' are getting very close to one another and they lean in for a major full blown pash, tongues and all! Steph suddenly wakes up and Max stirs before asking if she is okay, to which she replies yes. Max asks if it was a bad dream and Steph says yes, so Max kisses her and tells her not to worry and that he'll always be there to catch her. He snuggles back into her but Steph is wide awake. The inmates are out in the yard and Dylan and Stinger practice their basketball skills. The other prisoners start to welcome a new inmate - Roo!